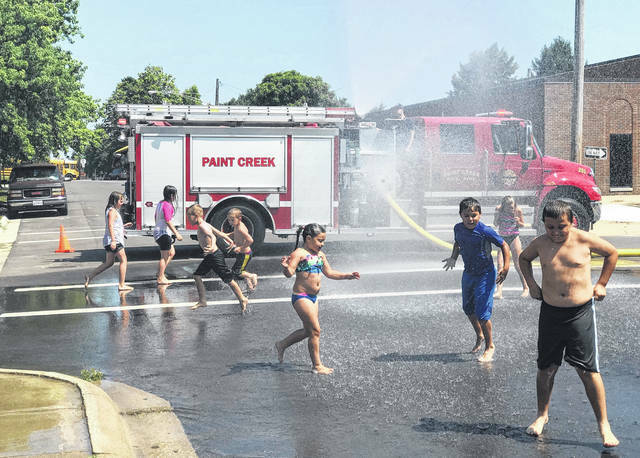 Paint Creek Joint EMS/Fire District’s ladder truck sprays water on a crowd of kids Friday in the parking lot at the district’s Hillsboro station. Youngsters enjoy Paint Creek’s “water day” event on Friday in Greenfield. 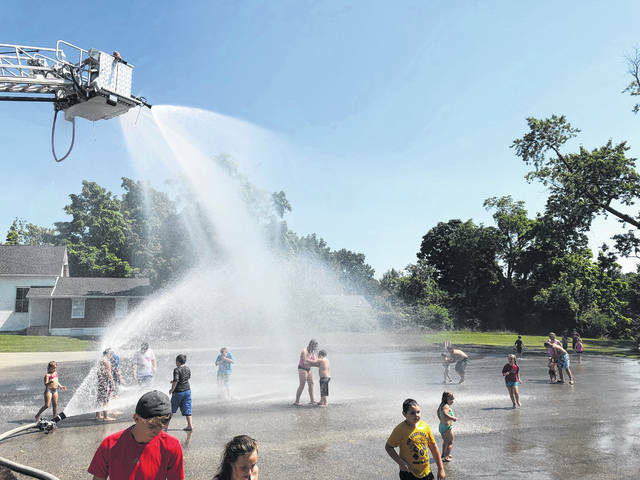 Local youngsters enjoyed some fun in the sun Friday as Paint Creek Joint EMS/Fire District trucks in Hillsboro and Greenfield released torrents of water for the district’s “water day” event. Paint Creek Public Information Officer Branden Jackman said the Hillsboro station alone saw about 100 kids come and go around lunchtime Friday, twice as many as last year. Jackman said the event is a great way for Paint Creek staff to serve the community in a way that doesn’t involve life-saving techniques or firefighting. The event began in Greenfield, but due to its popularity, it was expanded last year to include Paint Creek’s Hillsboro station. Jackman said Paint Creek coordinated with the Hillsboro City Schools Tomahawk Food Truck to serve meals after the hoses turned off. The truck, which serves summer meals to school-age children, provided food for about 360 kids each weekday last year, and organizers said earlier this year they hoped to increase the total to more than 500 a day. Another water day will be held Friday, Aug. 3 before local children head back to school, Jackman said.